What is a luxury charter without the privilege of indulging your taste buds surrounded by the most beautiful scenery? You can go for locally grown ingredients bringing the tastiest flavours to the simplest of dishes. Or savour complex masterpiece creations. Greek cuisine is an exciting culinary adventure on every plate. Efisia origin is physis, the Greek word for nature. Sheltered in a rough-hewn alcove, this epicurean restaurant finds the perfect balance between simplicity and gastronomy. Our recommendation is the lamb cutlets with a demi-glacé reduction and smoked aubergine. Selene is 33 years institution that has been relocated a few hundred meters from the Hatzidakis winer. Its outdoor terrace is one of the top scenic spots of Santorini. Picture yourself indulging yourself surrounded by a stunning view over the island with the shinning and deep see just in the back. 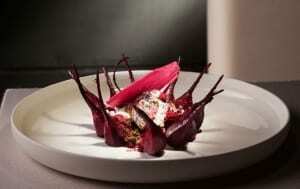 The restaurant promotes a renascence of traditional territorial cuisine. Selene also hold regular cooking courses for those who which to explore Greek culinary traditions. Built on strong family cooking traditions in 1992, Etrusco has picked up multiple prestigious awards over the years. 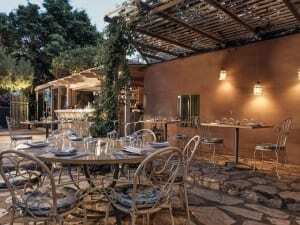 In 2017-2018 it has been named as the best restaurant in Greece by Athinorama magazine. Pride of the restaurant owner is a beautiful green garden, providing the fresh raw ingredients (vegetables, flowers and fruits) which enrich the restaurant’s characterful menu. This approach inspires their culinary philosophy of simple, subtle and natural flavours. For an indulgent gourmet experience head to Prosilio, next to Solomos Square, in the heart of Zakynthos town. Prosilio defines the art of tasty expertly prepared local cooking with a creative twist. Here you can also sample an impressive selection of Greek wine labels. Designed with a minimalist boutique interior and with a romantic garden courtyard attached, this luxurious dinner-only restaurant has a special warm ambience. To find out more about chartering in Greece, call +44 (0)207 499 5050 or email us.